This month, American comedian Conan O’Brien took an unexpected step into the world of international negotiations. 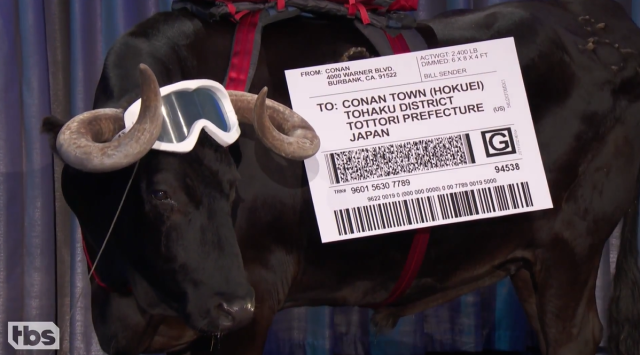 After discovering that the Japanese city of Hokuei, Tottori Prefecture, is also known as “Conan Town” (after anime/manga "Detective Conan," whose creator was born in Hokuei), O’Brien devoted a segment of his talk show to detailing the ways Detective Conan is just an imitation of him, such as both of them being men trapped in children’s bodies and having unusual hairstyles. He then demanded three trillion yen in indemnities. However, Hokuei’s mayor, Akio Matsumoto, then issued a statement of his own, telling O’Brien that if he wants justice, he should come visit Conan Town. O’Brien responded by adding additional demands (such as remodeling Hokuei’s Detective Conan statue to look more like the comedian), prompting Matsumoto to tack on supplementary demands of his own: his face on Mount Rushmore, a star on the Hollywood Walk of Fame, and 15,000 American hamburgers (one for every resident of Conan Town). So how is O’Brien going to satisfy those outlandish conditions? First, he says that he’s going to do Matsumoto one better, and instead of forcing him to share space with Washington, Jefferson, Lincoln, and Roosevelt on Mount Rushmore, he’s given the Japanese mayor a mountain entirely for himself in Burbank, California, where O’Brien’s show is recorded. ▼ Well, a mountain in the studio backdrop facsimile of Burbank, anyway. 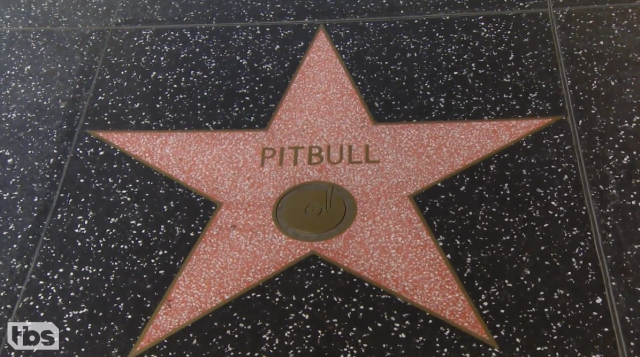 Next up, the Walk of Fame star. For this, O’Brien disguises himself as a security guard and heads out to the stretch of the sightseeing sidewalk ordinarily saluting musician Pitbull…and performs a bit of remodeling. Finally, regarding the burgers, O’Brien informs Matsumoto that since he doesn’t know how each resident of Conan Town wants their patty cooked, instead he’ll simply have an American cow air-dropped into Tottori, and the locals can grill it up however they like. Now, considering the logistics involved in a major U.S. television production traveling all the way to Japan, odds are a trip was already in the works for some time, and in researching things for O’Brien to do in the country, Conan Town came up, and the weird negotiation is something both sides agreed to from the start. Either way, though, O’Brien is headed to Japan, and we can’t wait for him to get here. Does Tottori even have an airport? I wonder if Jordan Schlansky will accompany him? HA! One? No, it has two of course! In a country where every uninhabited corner is covered to a depth of about 6 metres in various lawyers of transport infrastructure that exists solely to funnel money to construction and concrete companies, even Totorri has two airports. expat: "Does Tottori even have an airport?" Japan has some 98 + commercial airports, and even more used for private or military. Tottori has two, Tottori Airport and Yonago Airport (might have the name on the second, wrong). In any case, it was easy to guess he'd actually go. Maybe this will encourage President Obama to visit Obama town. He ought to - the Wakasa Bay / Mikata Gpko area is really scenic. Skip the Rainbow line, take the Angel line and the roads that hug the coast. Great camping and beaches. But no airports. Even though Tottori is quite off the beaten track, it's a great travel destination; pretty underrated imho. I live in Kansai area and regularly visit Tottori to escape the relentless crowds these days (I'm looking at you, Kyoto! ), it has many things to offer, from the sand dunes, beaches, highlands around Daisen (one of the best autumn spots), not mentioning its great seafood. Although you would probably want to rent a car once you arrive there. Will they broadcast the show from Japan, and if so, can we see it here? Hah nice, this is going to be awkward though. 1 bull will not feed 15k people. Plus a good burger isn't just about the meat. There is a slight amount of seasoning required. Not hard, but having an expert American crew handle it would be best to avoid unfortunate failures. My Uncle Mick was a master. Only if you promise to keep him there. I may need to watch/DVR Conan. 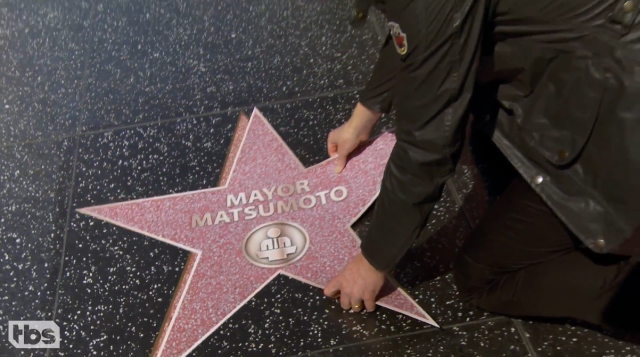 This is wonderful, and Mayor Matsumoto is no slouch in the sense-of-humor department. I'm looking forward to the Conan show when he visits. That was great! Conan O Brian is a funny guy! It would be great if that You ha nande Nihon ni kita? 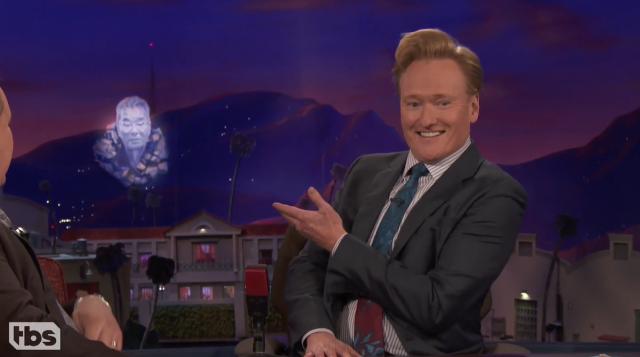 show would accidentally corner Conan at the airport, not knowing who he was. Conan is so funny and awesome! 1 bull will not feed 15k people. You get that this is all a joke right...? Mayor Matsumoto, should get a teenager to photo shop 3 trillion yen in his office with the mayor sitting on top of it with the slogan/comment saying "come and get it" and when he gets there the mayor will say "sorry mate its been stolen!"